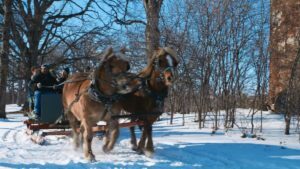 Celebrate winter in Wisconsin with a wonderful horse-drawn sleigh ride at Apple Holler Family Farm. As a blanket of fluffy white snow transforms Wisconsin, people of all ages enjoy a winter sleigh ride. Our beautiful Haflinger horses will definitely make you feel like a child again as they travel on a special orchard tour with breathtaking views of crisp snow and hardwoods. Along with the fantastic scenery in our Enchanted Forest, you will enjoy hearing the clump of the horses’ hooves as they make you long for a simpler way of life. To complete the remarkable winter experience, head on over to the warm campfire where s’mores, apple cider, and hot chocolate will be served. P.S. The horses LOVE carrots! Gather your family and friends and get ready to experience the horse drawn sleigh ride of your dreams. One of the best parts of this adventure is that both kids and adults can enjoy the sleigh ride. If you would like to reserve one of these magical sleigh rides near Chicago, give us a call at 262-884-7100. The Winter Wonderland Experience is available any time that we have snow. 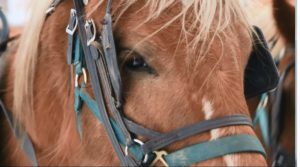 We promise that you won’t regret your decision to spend time with our Haflinger horses that we purchased from our kind Amish friends. Also, be sure to check out what our good friends at Time Out magazine are saying about us here. 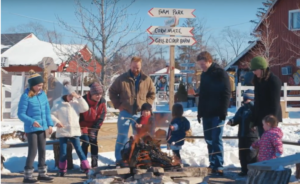 Even after the winter season, Apple Holler Family Farm is the ideal place for fun activities. We proudly present our visitors with farm tractor-drawn hay rides, a scrumptious restaurant, apple picking, puppet shows, pony rides, and Summer Fun on the Farm. Don’t miss out on what we have to offer!